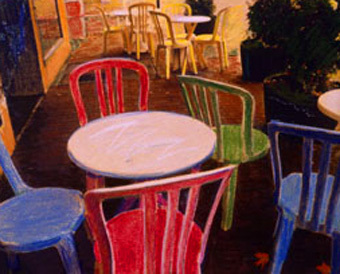 Patio chairs outside a deli in Westport, CT are left askew as busy patrons move on to the next thing in their day. A quick kielbasa with sauerkraut and a cold can of Dr. Brown’s Celray soda and that’s lunch. A Polaroid Image transfer with a swipe of pastels makes the whole thing more inviting.